Last week, as I was walking home on a cold winter evening, I caught a wonderful scent reminiscent of my pre-vegetarian days. Unmistakably, Boeuf Bourguignon. Home I went determined to come up with a vegetarian version. The result was a dish with all the flavor I remember. It's a real wintertime recipe. Particularly fun to note, we served this a few nights ago. When the guests arrived, they spoke of the inviting scent that welcomed them. 1 I like to begin this recipe a day early by preparing the little onions. To loosen the skins, drop them in boiling water for just a minute or so; drain them, cut off the little tops, peel off the outer skin, and slice off the little hairy root end. Put the onions in a pan which allows them to be in one layer as much as possible. Add water up to about half way up the onions. Add a tablespoon of butter and a dash of salt. Bring this to a simmer; leave cover loosely askew, and let cook 15 to 20 minutes until the onions are just tender when pierced with a sharp knife. Usually enough of the liquid has evaporated that the rest can be saved with the cooked onions and added together later. The onions may either be stored in the refrigerator or held aside during the continued preparation. 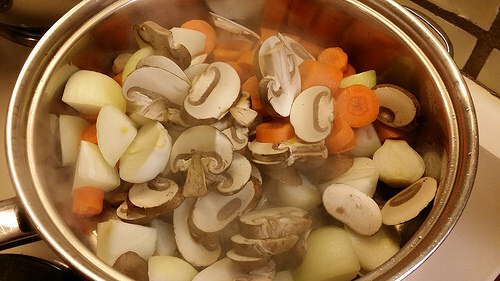 2 When you're ready to complete the stew, start by preparing the mushrooms. If they're little button ones, they may be left as is. If they're bigger, separate the stems from the tops, cut the stems in 1/2 inch slices, and the caps in halves or quarters. In a large saute pan over medium heat, add 2 tablespoons of butter and 1 table spoon of oil. After the butter melts, add the mushrooms and leave them to cook without stirring them, letting them brown on the underside. After a few minutes, gently move them around, again leaving them so they have an opportunity to brown. Sprinkle with a little salt, as desired. Set them aside while you continue preparation. 3 In a large sauce pan, over medium heat, add 3 tablespoons of oil. Add the sliced onions and minced mushrooms and saute so that the onions become somewhat translucent and the mushrooms begin to brown some. Add the garlic and stir cooking only about 30 seconds. Add the red wine, let it cook down some, a few minutes or so, and then add the tomato paste and bouillon, stirring together well. 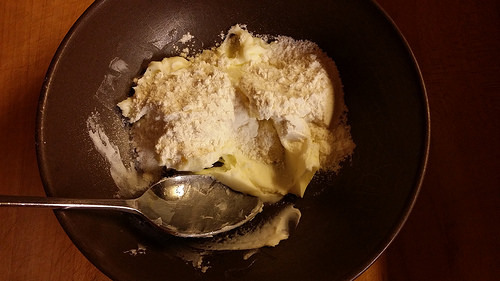 4 Make a roux by mixing together the softened butter and flour. Add to the roux some of the cooking liquid so that the roux is of a similar consistency as the stew. Then add the roux to the stew, continuing to mix well. Let this cook and it will thicken some. Add water to the desired consistency. 5 In a large casserole, if you wish to bake the stew (which seems to intensify the flavor), or a large pot if you're in a bit of a hurry, combine the sauce with the onions (including their liquid) and the sauteed mushrooms. Mix together well. If baking, have the oven preheated to about 375 degrees and bake uncovered for about 20 minutes or so until the contents are visible bubbling. If finishing on top of stove, heat contents of pot until everything is bubbling nicely. 6 We serve this with some wide noodles, cooked al dente, a mesclun salad with a simple vinaigrette, and some really crusty rolls (don't skimp on the butter). 7 This makes for a very hearty and delicious winter's meal.